Are you a fan of Arrow Cabinets? Check out our new page on Facebook and become a fan of us. Post comments or questions, or just enjoy our lovely pictures. This highly versatile piece of furniture can be used for pretty much anything, including scrapbooking, crafting or even as a piece for your office. Matter of fact, I have one of these in my office. So get out there and win that contest. Watching TV the other night, a preview for a new movie came on, Julie & Julia. The premise of the movie was Julie a young woman would prepare one meal a day for 365 days, out of the Julia Child's cookbook and blog about her experiences. This idea intrigued me. 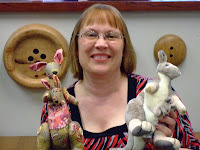 So starting in July I have challenged the staff here at Arrow & Kangaroo Cabinets to do a new crafting project each month and then blog about their experience. Our first project will be taught by Jo , our resident quilter guru, she will teach us all the art of quilting by making a small quilt runner. The following months will be cross stitching, punch needle and scrapbooking. Poor Phil! Just what every sales guy wants to do, learn a new craft project once a month. We will try and "man it up" for him! Please follow along on our summer adventure. 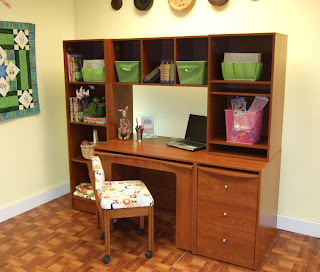 We would love to hear any suggestions for small crafting projects an office environment can do. 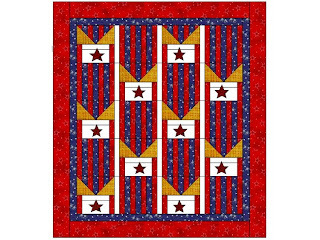 Sew-ists and Quilters love patriotic holidays because they give us a reason to make a new quilt for the season! I am calling this design my Medal of Honor quilt and hope to share it with you. The two blocks will be paper pieced and anyone interested in the blocks and instructions can email jo@arrowcabinets.com for PDF copies. The 5 pointed star would be appliqued or fused onto the white rectangle which ever is easiest for you. I personally like using fusible web because it is quick! There is an interesting story about the 5 Pointed star in American history. According to legend and probably fact, Betsy Ross was approached by George Washington to make the first American flag. George wanted her to sew the stars with 6 points because of the mathematical difficulty of creating an 5 pointed star. Betsy simply folded a piece of paper and with one snip of her scissors, created the star! If you don't believe me, read about Betsy at http://www.ushistory.org/BETSY/flagstar.html and you can even get the directions for your own One Snip 5 Pointed star. I will be posting more about my quilt as I try to have it done by the 4th of July with pictures to inspire and amuse you!